Be the first to share your favorite memory, photo or story of Erling. This memorial page is dedicated for family, friends and future generations to celebrate the life of their loved one. 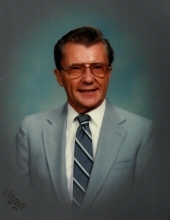 Loving husband, father, grandfather, Erling G. Behrens, 95 years old, passed away Tuesday, January 29, 2019 at the Lutheran Home in Arlington Heights. He was born January 25, 1924 in Elk Grove Township, IL, the son of the late Alvin and Gertrude (nee Busse) Behrens. Erling is survived by his wife of 69 years, Florence (Stoeckel) Behrens. He is also survived by his son Ronald (DiAnn) Behrens and two grandchildren, Nathaniel and Jennifer Behrens and many nieces and nephews and their families. He was preceded in death by his sister, Melba Pingel. Erling served in the U.S. army Air force during World War II where se served in the Southwest Pacific Theatre. He enjoyed fishing, camping and square dancing. Visitation will be held Friday, February 1, 2019 from 3:00 PM until 7:00 PM in the Resurrection Room at the Chapel of St. John the Beloved, Lutheran Home, 800 W. Oakton, Arlington Heights, IL 60004 and on Monday, February 4, 2019 from 10:00 AM until the time of the funeral service at 11:00 AM at St. Matthew Lutheran Church, 24500 N. Old McHenry Road, hawthorn Woods, IL 60047. Interment will follow at Memory Gardens Cemetery, 2501 E. Euclid Ave, Arlington Heights, IL 60004. In lieu of flowers, memorials may be made to St. Matthew Lutheran Church. To send flowers or a remembrance gift to the family of Erling G. Behrens, please visit our Tribute Store. "Email Address" would like to share the life celebration of Erling G. Behrens. Click on the "link" to go to share a favorite memory or leave a condolence message for the family.